Let’s all be glad Stan Lee is still alive. Let’s all be sad that the words “Stan Lee” are still appearing in front of new things. Look, no one can deny that Stan Lee had a hand—arguably a major one, depending on whose accounts you believe—in creating iconic superheroes like Spider-Man, Iron Man, and the Hulk. When the comics legend is 92 years old, and when the things his name have been slapped on for the past couple of decades have largely been nonsense, you have to wonder just what is going on at this point. Whatever it is, it’s a bummer. You have to question how much fire he’s still capable of bringing to new work. I’m not saying that age is a factor but the way the work is coming out certainly is. It feels like someone out there is wielding a rubber stamp with the words Stan Lee imprinted on it. That person might not even be The Man himself. Note: This article originally ran on 3/25/15. The newest project with the Stan Lee name on it is Stan Lee’s Hero Command, an iOS video game released last week that lets you control a bunch of lesser-light heroes. The gameplay experience is comprised of chunks of shallow beat-em-up action, broken up by upgrades and training sessions. Like many free-to-play games, it only lets you play for a certain amount of time before you run out of “energy.” Once you’re spent, you either wait for the energy to recharge or pay for restore the juice needed for continued play. It’s not exactly the Spider-Man, Iron Man, or Hulk of video games, and so you might rightly wonder what Stan Lee’s name is doing on the game and just when “Stan Lee presents” stopped being an indicator that those words referred to anything great. 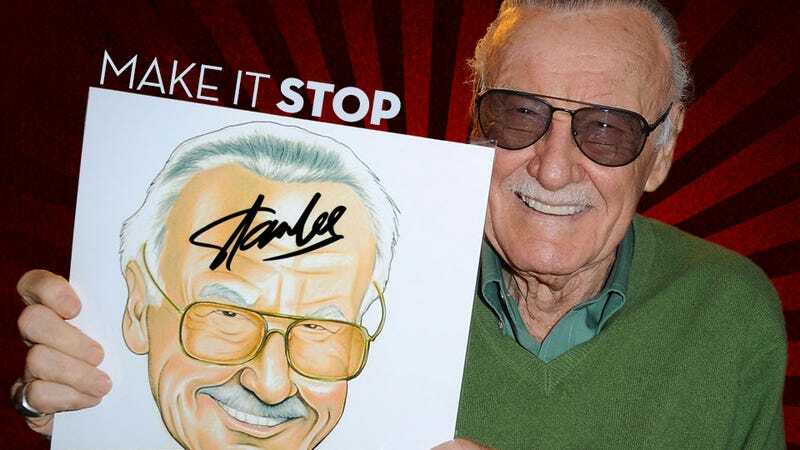 Like the bite of a radioactive spider or Dr. Abraham Erskine’s Super-Soldier Serum, the Stan Lee Participation Formula seems to give the legendary creator the proportionate speed, strength and agility of a perpetually caffeinated telemarketer. Longtime comics aficionados will note that Stan Lee has always been a hype man, always been a carnival barker. That’s very much true. Lee was groundbreakingly prescient in a way that other comics legends weren’t: back in the 1970s (80s?) he was one of the first creators to present his individual self as a brand. It was an extension of the hype work he’d already been doing for Marvel in the 1960s, which turned him into the public face of the company. He’d earned his spot at Marvel. As a smaller concern in its Silver Age glory days, Lee was indispensably woven into the fabric of the company’s fictional and real-world evolution. He’d anoint talent, take business meetings and glad-hand with boundless energy, all while writing and editing at least half a dozen comics a week . There was clearly a forceful will and drive in evidence, one that created an antagonistic rivalry with DC Comics that continues to this day. Stan Lee was in those comics. You could feel it. At some point, though, seemingly as he broke from Marvel, it became harder to be impressed by the master showman. The Stan Lee-branded projects that have come out for the last 15 years or so is that they’ve felt like uninspired cruise-control partnerships. Hero Command is just the latest, a Clash of Clans imitator that feels like yet another product rolling off a conveyor belt of a mill made to slap Stan Lee’s name on things. In his many interviews and video appearances, Stan certainly seems lucid and it feels like he’s got the energy of a man 20 years younger than him. But the creative output has felt like a bunch of warmed-over past glories. You can trace this trend back to the Just Imagine Stan Lee projects done in partnership with DC Comics in the early 2000s. In a series of standalone comics, readers were presented with Lee-generated remixes of DC’s most popular characters. So, Batman was an African-American wrestler named Wayne Williams and Wonder Woman is Maria Mendoza, a Latina woman who was granted the powers of the Incan Sun God. The novelty of Lee reinventing the characters he once competed against was the conceptual hook here and, while its appeal is shallow, Just Imagine feels like an Olympian achievement compared to what followed. Take Election Daze: What Are They Really Saying?, the 2008 humor book credited to Stan. For the most part, it’s a collection of pictures of politicians and presidential candidates with would-be-funny word balloons slapped on top of each, something a college comedy magazine could pull off. Sure, Stan did more than just superhero comics over the course of his career. But this still smells like cash-in. The same aroma comes up from Stripperella, the decade-old Pamela Anderson vanity project featuring animated crime-fighting stripper Erotica Jones. Everything about it felt half-assed and it had the added shame of making Stan seem like a dirty old man. Maybe the people involved really thought they were birthing a multimillion dollar transmedia franchise that would compete with something like, say, Tomb Raider. But, even for a cottage industry operating under a brand-uber-alles ethos, this was an embarrassingly bad call. Things like 2011’s The Guardian Project—where Lee would putatively be creating a superhero for each of the NHL’s teams—felt closer to his core competency. But, again, the spark just isn’t there. It feels like news of a new Stan Lee Deal comes down the pike every few months and, with a few ugly lawsuits over who gets to use Stan’s name in recent memory, the prospects of any magic emanating from any of the seem dimmer and dimmer. The books on the website for Stan Lee’s Kids Universe, for example, are cookie-cutter generic, destined to be burned off in cut-rate sales from any outlet foolish enough to order. We’re at the point now where you have to wonder if Stan himself is participating in any way in these projects. Sure, they all have the hallmarks of the silver-age Marvel formula that Lee helped to create. But that formula is easily replicated and appropriated; almost any writer could do a mock-up of it. As an aggregate, these latter-day projects have long past the point where they’ve diluted Lee’s legacy. If he weren’t buoyed up by the high tide of Marvel enthusiasm generated by the company’s Hollywood success, the Guardian Project and its ilk would probably be laughed out of the room. They certainly wouldn’t be newsworthy. Now, people might say that Stan’s always been a huckster, someone getting—or taking, in the most ungenerous view—credit for the success of things he didn’t actually create. When he went to DC in the 1970s, Kirby even created a character called Funky Flashman as a parody of his former partner. There’s long been a controversy as to whether Lee even deliberately minimized the contributions of others himself. The creation of characters like the Hulk, Thor and Spider-Man always happened in partnership with artists. But Jack Kirby, Steve Ditko and the other people who drew these superheroes haven’t become household names like Stan’s has. To those who’d argue that the new Stan is the only Stan there’s ever been—that he never was an impressive creative force—I’d say you’re wrong. I’d argue that there’s enough commonality in the Marvel editorial product of the 1960s/1970s to serve as evidence of Lee’s participation. Compare, say, the heyday of his Fantastic Four partnership with Jack Kirby to the latter’s solo New Gods work for DC. The same cosmic themes may be there in the rival publisher’s Fourth World saga but there’s no analogue for the soap-opera character dynamics and dialogue that came from Reed, Sue, Johnny and Ben in the initial adventures of Marvel’s first family. The truth about who contributed what to Marvel Comics’ early iconic successes almost certainly lies in the conceptual middle. But the stuff he’s done in recent times hasn’t been memorable. You can’t feel him in there. Oh, sure, there’s a Stan Lee facsimile attached to each thing. But that’s not fooling anyone. That brings us back to now, to a time when Lee is rightly honored with cameos in Marvel movies at the same time Lee’s name gets slapped onto more forgettable product. Part of the problem is that there’s a needy, all-too-willing nerd culture that stands at attention every time Stan Lee is attached to anything. Stan Lee cologne? It’ll get written somewhere. Blurry pics of The Man’s latest cameo in an upcoming Marvel movie? Prime fodder for the faithful. (And, yeah, we’ve occasionally been guilty of it on Kotaku.) But, more and more, it feels harder to escape a sense of sadness floating over all the late-day Stan Lee lionization. Doesn’t he need some rest? Is he someone else’s golden goose, laying precious eggs of monetized nostalgia at their behest? Worse still, this over-ebullient deal-making lends credence to the more unflattering characterizations of Stan Lee: that he’s a gloryhound who wants to burnish his brand at all costs, that maybe he wasn’t all that integral to the creation of Spidey, Tony Stark and all the rest. Logic dictates that he probably wasn’t the sole god-like creator that birthed the Marvel Universe despite what mangled media narratives would have you believe. But what else is he? Right now, he’s an nonagenarian suffering from terminal brand dilution. But it seems like no force in the universe can stop that from happening. Excelsior.